Earlier this month I got the opportunity to get out and enjoy a brand new place that I've never seen before! And on top of all that-it was a celebration for ME!!! Yep. It wasn't my birthday or Boston's even. It was special birthday anniversary event for the show I host on 95.7 Ben FM called Real Mom Radio. The show has really been a labor of love for me. You see, prior to this awesome and rewarding internet world I was a radio host for many years. The times changed and so did media. The Program Director at Ben FM loved what I was doing and we connected on possibly having a show highlighting moms in and around Philadelphia…thus Real Mom Radio was born. Who WOULDN'T turn down a party? ha. Not me..that's for sure. I had an absolute blast at the event. Well…..as much as one could have when battling a stomach virus. (The night before I stayed at the shore-and I ate my favorite food in the world. DUN DUN DUN….A Lobster Roll sandwich. 1) Take a Boat Ride. 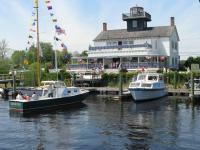 Tuckerton Seaport is conveniently located on Tuckerton "Crik". Explore the area with a fun boat ride! Don't forget your safety jacket! 2) Hang Ten. Did you know that surfers and pirates hang together? Well… at least they do here. lol. 3) Lighthouses. Something about lighthouses scream east coast to me. They always give me that ocean feeling. Barnegut Bay Lighthouse is located right near Tuckerton Seaport Museum and it's pure awesomeness! LOVE lighthouses! I always find history especially in our area interested. And while at the Seaport I read that Tucker's Island Lighthouse was built n 1868 on Tucker's Island. What's wild is that it fell into the ocean in October of 1927. There are so many fascinating stories of the lighthouses and their keepers, shipwrecks and the U.S. Lifesaving Service. 4) Fishing. 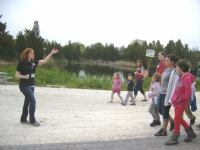 Tuckerton is a great fishing location with many different creatures to catch. I also learned that when the fisherman talk 'pounds' they aren't talking weight or $$. Pound fishing is a system of nets that trap fish that were constructed from the ocean. 5) Fun Events All Year Long. This summer you can expect to enjoy an antique car and truck show to a lighthouse run in October! 6) Make Flatties. I have to admit, prior to attending this super fun event-I had no idea what a Flattie was. I do now! 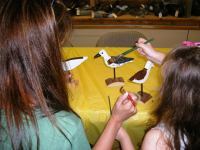 They are these fun handcarved wooden ducks you can paint and pretty up while at the Seaport. I didn't get the chance to make one-but I'm surely bringing Boston back to make some. You can do it with your family as well! 7) HANG TEN TIME! How cool is it that they have New Jersey Surf Museum on site? I often thought of surfing as a California/Hawaii sport. I can't think that anymore! Check out the museum to see some fun surfing exhibits. 8) Play a 10 hole mini-golf course. Yep! We are a mini golf crazed family and LOVE to play whenever we get the chance. So, being able to add that to the fun at Tuckerton? We're in! You can learn a lot about the place during the game. Each hole gives you info about Tuckerton Seaport. 9) ScoJos Restaurant. We were so blessed with eating an awesome meal from ScoJos during our event and it was AWESOME! A great outdoor setting to enjoy a sandwich or a salad is a perfect fit for me and my family. How about yours? 10) 40 Acres of FAMILY FUN! Can you believe they fit so much family fun tucked away in a town on 40 acres? From history to boatrides to nature, this place is a great setting for any activity, events-weddings-birthdays and more! Be sure to like them on facebook: Tuckerton Seaport and Twitter!